Being a huge fan of the Google Picasa Desktop Client, from time to time I use the Picasa Web Albums to share a few photos with Friends and Family. 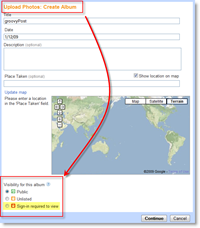 In the past, one thing that always bothered me about the Web Albums was their mediocre security. Even if I made the Photo Gallery Private, the security built around the Album is based only on a Security Key in the URL. So once you gave out the URL, you just gave up the control of WHO or WHAT was able to view your photos. Sign-in Required to View – PERFECT for those pictures of the Kids you don’t want out on the Internet! What if the person you invite doesn’t have a GMAIL account? After reading the announcement, this was the first thing I tested out. 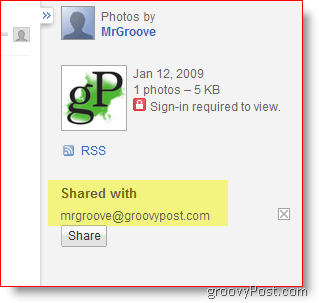 I set up a new Photo Album, configured it to Sign-In to View and then invited my groovyPost.com email address using the SHARE feature of the Web Albums. scenario. A few moments after sending the Share Invite to a NON-GMAIL account, the email from Google Picasa showed up informing me about an invite to view a Photo Gallery with a Link. When I clicked the “View Album” link it took me to a page and prompted me to log in. Under the Login Box was a “Create an Account” box which allowed me to create a new account USING my Non-Gmail account. 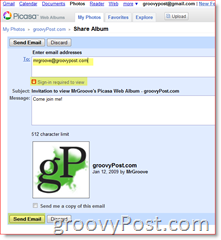 Once I created a Google Account using my @groovyPost.com email address (Didn’t know I could do that) I was dropped into the Picasa Web Album and was able to view the Photos I shared out. 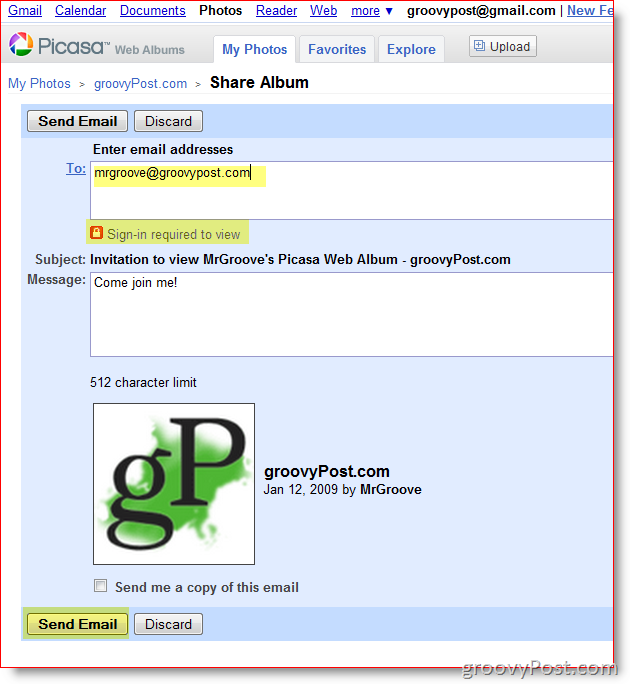 Nice job Groovy Picasa Google people! VERY smooth implementation! How-To Lose Face with Google Picasa : Literally!